Every year, the killings of protesters against opencast coal mining at Phulbari in Bangladesh are commemorated. Plans to construct a huge opencast mine are being pursued by London-listed GCM Resources. This year, a meeting was held in London to pay homage to the protesters. The event was organised by our friends in Phulbari Solidarity Group and the UK branch of the Bangladesh National Committee and supported by LMN member group Global Justice Now, which has long worked on the issue. 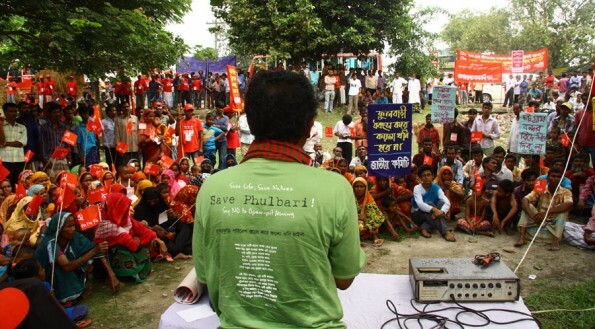 A few days before Phulbari Day, Bangladesh’s state minister for energy and mineral resources stated that there is no hope for any mining company to extract coal from the coal deposits of Northwest Bangladesh in Phulbari. The statement may be simply to gain support ahead of elections. Let us hope that the Government of Bangladesh finally scotches this ill-conceived project.